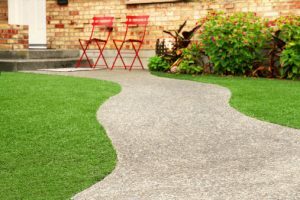 If you are looking to improve your entire outdoor space and are searching for established and reliable Groveton landscaping companies, try calling Complete Lawn Service. Complete Lawn is the premier lawn service serving Northern Virginia, and we can provide all your lawn care and landscaping needs. Your home deserves a professional and well-maintained landscape, and a beautiful and functional outdoor space not only looks great, but it improves your home’s resale value…studies show that professional landscapes increase a home’s value by as much as 15%! Lawn and Shrub Care. In addition to mowing and edging your lawn, we recycle grass clippings and weed-whip unreachable spots. We also offer a variety of specialized lawn care programs that create a lush, insect-free lawn, and we keep shrubs and flower beds properly trimmed and healthy. Landscapes/Hardscapes. We design landscapes that offer both visual appeal and function, with a well-balanced arrangement of flowers and bushes. We do hardscapes too, including walkways and patios, and we ensure that your outdoor space features proper drainage to maintain healthy soil. Irrigation. Our Certified Irrigation Designer will evaluate your property and design a sprinkler system that can properly keep your lawn and plants irrigated without wasting water. We stand by our sprinkler systems and maintain them, and we can upgrade it if needed. Complete Lawn provides other services too, like wiping out those pesky Virginia mosquitoes with environmentally friendly oils, and we use our plows for snow and ice removal in the winter months. We hope you’ll take a look around this website and learn more about our services, including shrub and bed care programs and irrigation design. Our complete suite of services and our personal touch are what sets us apart among Groveton landscaping companies; Complete Lawn does it all! Contact us today for a complimentary consultation. We look forward to beautifying your home.